Posted on August 31, 2011 by Elizabeth E.
Our little Quilt Group (Good Heart Quilters) wants to do an exchange of fat quarters in October of Halloween Fabric. I’ve already got mine ready to go, but then I thought–go where? So I got out my quilt program and cooked up this little house quilt. This is digital–I’ll be working on mine for the next month, but I can see someone appliqueing ghosts coming out of doors, embellishments, witches riding in the sky. I made up the plan for this quilt. I call it “The Plan” because I couldn’t figure out how much bigger to print it out to make it real, honest-to-goodness templates. 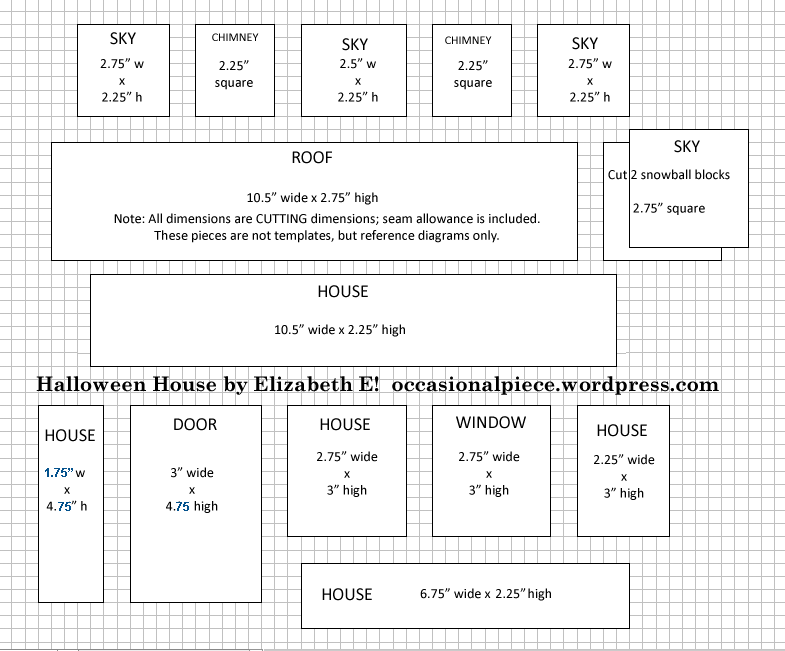 So, in case you want to make yourself a quick little Halloween House Quilt, here it is as a PDF file to download: halloweenhouse. I also envisioned using this as a place to lay out your cut pieces, so you know you’ve cut the right ones. Please use the dimensions given to cut your pieces, as believe me when I say I doubt very much it will print to the right scale. Forgive me, I didn’t take that class in college. This post is to get you thinking about what fabrics you’ll use, and how you’ll use them. I’ll have more later on about construction, but tomorrow I’m getting on an airplane and going to my nephew’s wedding in Salt Lake City, Utah and plan to celebrate some newlyweds. I will have a post on FSFriday, so you can see what I finished this week, and when I return I’ll start into the fabric cutting and piecing for Halloween House Quilt. 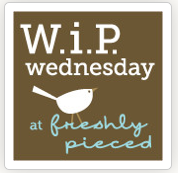 Many many thanks to our generous Lee, at Freshly Pieced Fabrics, who hosts this WIP every Wednesday. Thanks very much! Elizabeth, this is SO cute! I have a stack of Halloween fabric sitting and ready to go, but I had the same question: Go where? Great solution! I had to come visit you (from your comment on Cindy’s blog post today)…loved what you had to say about the illusions that reading blogs feed in to. And I am loving this little Halloween idea… I do Halloween posts all October long just because I love Halloween. Pingback: Halloween House Quilt Block « OccasionalPiece–Quilt!